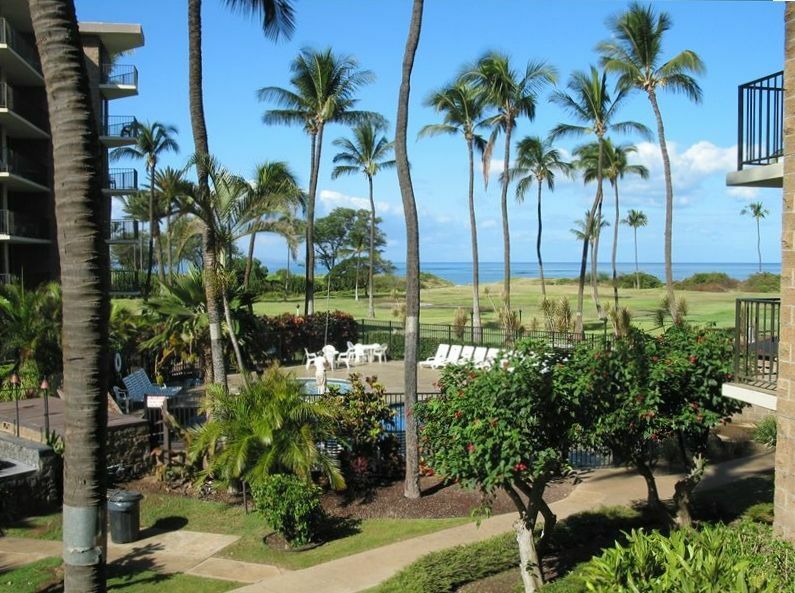 Maui is a beautiful vacationing spot and our one bedroom condo located at Kauhale Makai (aka Village by the Sea) is the perfect place for you to stay for your visit. Our condo, Unit #207 in the Anthurium building, has a king-size bed and a queen-size wall bed in the living room, making it suitable for two adults or a family of four. There is a fully equipped kitchen. New furniture was updated in January 2016. Granite kitchen counters installed in April 2016. There is an ocean front view from the covered balcony as well as from the living room and bedroom. The Village By The Sea complex has a swimming pool, kiddie pool, and hot tub. There is also a putting green, shuffle board, or the front desk always has other fun suggestions for you as well. It is a non-smoking complex. This is a nice one bedroom condo with an ocean view in the distance. The property is well maintained and the common grounds continue all the way to the ocean. The property is usually quiet at night and young kids seem to love the pool area. Glad you enjoyed your stay. We look forward to having you stay with us again. Thank you so much for letting us stay in your wonderful condo. We had an amazing time! It was well located, the decorations were beautiful and super clean. We will definitely recommend this place to our friends and family back home. Mahalo ! We loved the condo, nice furnishings, great bed. The grounds are well maintained and the pool is heated. The BBQ's are clean and easy to use. Hope you can come back again soon. My husband and I stay in this lovely condo for 2 whole weeks as we celebrated our 30th wedding anniversary. Kihei is the perfect central location for day trips to Lahaina, Hana, Makena and countless beaches. Delicious food choices are around every corner!! We really liked the king size bed and full kitchen. We were able to enjoy several meals at the condo and on the lanai. I would highly recommend this condo to anyone looking for a great place to stay! So happy you had such a great time at our condo. Thanks for staying with us and hope you can come back again! This place was perfect for our week long family vacation. We loved the beach which was only steps away and often had it to ourselves. The kids spent hours in the pool. Everything was clean and comfortable. We used the bbq's by the pool most evenings. We watched Humpback whales in the ocean from the lanai while we were eating our lunch. My husband appreciated the high speed wifi in the condo so he could continue his work while away. The full kitchen was perfect. We also appreciated the beach chairs, umbrella and sand toys for the kids. It felt like home and we didn't want to leave. Thank you Julie for such a great place. We will definitely be coming back! So glad you enjoyed the condo and got a little R&R.